Entrevista publicada na Revista Doc On-Line, em 2008. D. Scott Hessels is a media artist and independent filmmaker who has released art and commercial projects in several different media including film, video, web, music, broadcast, print, and performance. Producing under the name Damaged Californians, his films and videos have shown in hundreds of international film and new media festivals, on television, and in contemporary art galleries over the past 20 years. He recently completed a commission of three interactive films and six online movies for Australia and was honored with career retrospectives at the Melbourne International Film Festival and the Dallas Museum of Art. Scott currently is teaching at the new School of Art, Design and Media at Nanyang Technological University in Singapore. More recently, Scott has been experimenting with the cinematic form and his recent artworks have mixed film with sensors, robotics, GPS systems, and alternative forms of interactivity. In 2008, he is premiering “GPS Film”, a location-based cinema device, at ISEA in Singapore. Karla Brunet: After attending to your presentation at ISEA2008, I became very interested on the new possibilities of the GPS films. For that, I would like to ask you some questions regarding the creation and production process of the film as well as its reception by the public and forms of distribution. As a start, please, tell me how the film was done? Was if recorded in digital, Mini-Dv or film? Scott Hessels: We shot the film on HDV (1k High Definition) using Canon H1 cameras. The rest of the equipment – the cranes, dollies, lights, etc – were all standard film equipment gear. KB: Did the film use the traditional structure of cinema (director, screenplay, director of photography, actors, production…) or it used a different model? SH: The production crew followed a standard cinema model – the director, DP, actors, sound, etc. The screenplay was handled very differently, however, since it was non-linear, non-cause and effect. The film is told in flashbacks and we shot earliest flashbacks first and then moved up in order towards the present moment. With such an unusual story structure, it was the best way for the crew and actors to conceptualize and understand what was going on. KB: How many people were involved in the production? SH: Cast and crew totaled 50. Kenny Tan, the director, insisted that everyone on the crew also be an extra in the film…even I’m in there playing a 1970’s disc jockey. KB: What is the total length of the film? SH: With nine neighborhoods, the opening and the closing, it’s 110 minutes. There is a two minute opening that introduces the characters and the climax situation… This refreshes the memory of the mobile viewer but also gives the hardware time to connect to the GPS satellite and download the first needed coordinates. KB: As I understood, the film is divided in 9 parts, how long is each part? SH: We shot 10 minutes of content for each of the nine neighborhoods. We slowly walked through each neighborhood and measured how long it took to get from one edge to the other. Then we did a taxi ride through each neighborhood, so we had the fastest and slowest time it took for each zone. Each of the nine scenes has the most important information early on, so you get what you need to know if you’re in a taxi or bus, but then runs for 10 minutes of extra information if you’re walking. It was a writer’s nightmare. KB: How is the film sent to the public? Is that via Bluetooth, MMS, 3G connection…? Do the public need to download the player first? Or the film can be played on most of the players? SH: Right now the player and the movie are a download off the website for free. 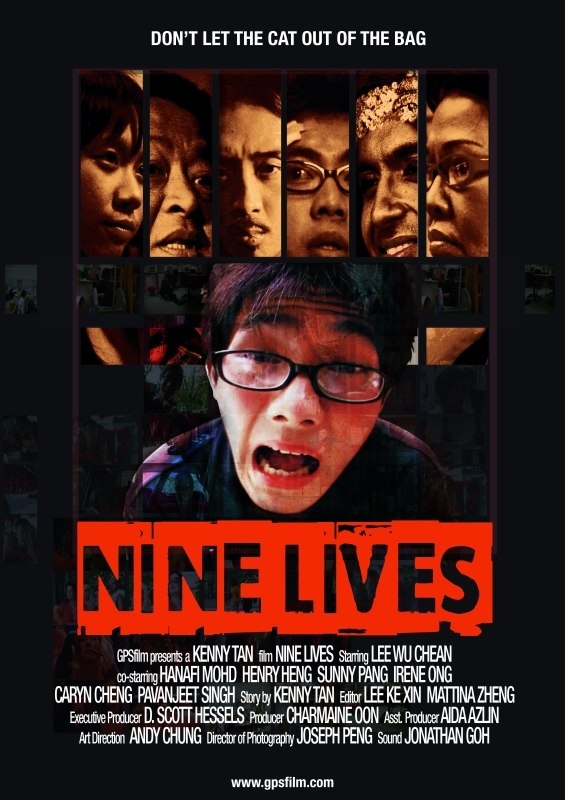 The default setting is to watch “Nine Lives” in downtown Singapore. We’ve also posted the source code on the site so a moderately-savvy user can change the coordinates to nine different zones and watch “Nine Lives” in downtown Stockholm or the LA Botanic Gardens or wherever. The entire film is copied to the hard drive of the PDA or mobile phone… That’s one lucky thing, the screens are so small, we can compress the movie and you carry the whole thing… No worries about delivery. The system works on any Windows Mobile device – almost all PDAs and many mobile phones. Right now Nokia is porting it over to Symbian (an open source OS) so it will work on their phones soon. I got an email from some guy in Israel who’s almost got it ready for iPhones. A bunch of college kids in the US are playing around with other versions… It’s out there now, we built a rough prototype, but people are definitely running with it. KB: What is the distance from one location to another? I mean location by the location of certain part of the film. How long does it take to someone to get to the other location and be able to watch the other part of the film? SH: I’ve never actually measured the neighborhoods by kilometers…I never needed that information. We determined the zones by just walking around and, oddly, Singapore’s Central Business District broke up into very even sections – Chinatown was about the same size as the Financial District which was about the same size as the Riverfront. We stood on corners and got the coordinate readings of the intersections of the neighborhoods and input those coordinates in the code. Pretty minimal math. The code can be used any way – the neighborhoods that have video associated with them can be adjacent or miles apart – but for “Nine Lives” we did it adjacent. You cross from one zone to the next. You can be on one side of street and see one scene, cross the street and see another. KB: Is there a determined period that the film is played? Here I mean dates, as in traditional cinema where the movies are played for certain amount of weeks. Is GPS Film always being played as if it were a film on the web that one can watch at any time? SH: It’s a movie in your pocket… You download it and watch it whenever you enter the story space… so there’s no ‘release window’. It’s not the YouTube model – play upon request – but a different model somehow…. Maybe play upon entry? KB: Do you have any idea of how many people watched the film? SH: The Singapore paper did a big article on it and there’s been a ton of other regional press. I’m deliberately not tracking downloads…just a personal philosophy as an artist. I know that it’s being played with tho… We’re getting some great emails about the movie. SH: Not really…although I’m afraid it’s still rather upscale. GPS PDAs are still a bit of a luxury item and only the high-end mobile phones have the device yet. So right now it’s probably executives and techno-geeks. It will change as the technology becomes more ubiquitous, but right now it’s just not in the hands of the poorer classes. I guess that’s sadly true with all computer technologies. KB: Did you get any feedback of the public? How did the public react to it? SH: Singapore loves its toys, it’s a very technically savvy country and very open to new technologies. The response has been amazing from the emails. I more fascinated by the content producer side of it though. The viewers are more upscale, but the people playing with the source code are at the university level… It’s kids playing around with planting video in spaces and figuring out new narrative versions for it. KB: Do you have any statistics in relation to the order of the fragments that the public watched the film? Are some parts a lot more watched than others? Did you take that in consideration when creating the narrative? SH: We knew a little about the human traffic patterns of downtown Singapore and adapted things a bit…. not really on purpose, but just by accident. The Pearl’s Hill section has more depth to the story because we knew people would be watching it while sitting in a big park. Same with Chinatown, we assumed it would be watched at restaurants and cafes and we wrote to make that experience more interesting. We used less dialogue and more action in areas where there was more noise or more likely to be commuting. “Nine Lives” can be layered onto any space, but we did write it with downtown Singapore in mind. We’re getting the most comments from the Pearl’s Hill section which creates the fake folklore of the SingaKuching, this lucky stuffed cat. In that zone, you see the cat passed down through generations and its effects on the owners…It’s so goofball and people seem to love slapstick comedy. KB: Were you influenced by Julio Cortazar’s “Hopscotch/La Rayuela”? Or any other literature reference? Or by the non-linear cinema (as for example Peter Greenaway)? SH: I’ve been playing around with database narrative for quite a few years now – the “Brakelights” piece at Ciberart was a good example. I don’t like the hyperlink model of it though and am trying to do it with more cinematic qualities – conflict, climax, etc. When we were writing “Nine Lives” we used the metaphor of a house – imagine entering a house and walking around. Every room would tell you more about the family that lived there and it wouldn’t matter which rooms you visited first or how long you stayed in each room. We had a very architectural approach to the narrative… It was the exploration of a space to reveal story. In the end, the flashback structure worked very well and we played with several stories using it – seeing a couple kiss at the beginning and then having each neighborhood reveal how they came to that moment, etc. We also considered each neighborhood being a different character (like “Roshomon”), a different point of view (like “Vantage Point”), documentary (where each neighborhood is a question of who, where, when, what, how), familial and rhizomatic like the Greek constellations, or a shared event where each neighborhood would react in a different way to one thing. Some at ISEA suggested planting music videos in neighborhoods – a kind of real-time scoring of a journey. Navigational storytelling has a rich history – cave drawings, amusement parks, cathedrals. I think personally I was most influenced by the Situationist derives… It’s an exercise I make my students do so I’m watching environment shape story over and over. Recording is linear, narrative is not. The limitations of technology took the loose, malleable traditions of oral storytelling and made them fixed and linear – books, cinema, radio, television, computers. The idea that cinema is something viewed while seated and stationary is not a formal property of the medium, it was a limitation of the technology. KB: Do you plan to do others GPS Film in the future? SH: We’re being approached by different vendors interested in more commercial applications to it. I’m passing those on to Kenny, who’s a very promising film student. I have the attention span of a flea… I’m sure I’ll be on to something else very quickly. KB: Is there a way I could see the film or parts of the film on the web? Or it only can be seen on the windows mobile? SH: You can download the movie to a mobile device and just play the movie… It’s possible to override the GPS coordinates. We’re hesitating putting the whole movie online (like on YouTube) because it will void its festival possibilities that like premieres. We may have already ruined that possibility by making it downloadable to mobile players, but there’s no precedent so we’re waiting to see. It’s a fun movie all by itself, I’d like to see it play in other venues beyond handheld. Professora Colaboradora do Programa de pós-graduação em Comunicação e Cultura Contemporâneas da Facom/Ufba. Pos-doutoranda do Grupo de Pesquisa em Cibercidade (GPC)/Ciberpesquisa com bolsa Fapesb. Doutora em Comunicação Audiovisual (UPF – Espanha) e mestre em Artes (MFA – Estados Unidos). Designer, professora da FIB, Centro Universitário da Bahia, Mestre em Artes Visuais (UFBA), especialista em Design Gráfico (UNEB).